My mother took me to see this when I was ten years old and inexplicably decided to leave halfway through, taking me with her. Didn’t she know that I would be writing about it 46 years later? The new Twilight Time Blu-ray disc of Peter Yates’s The Hot Rock is a delight. It looks immaculate. (Even the half-screening I saw when the film was originally released in 1972 didn’t look this good.) The film itself is a corker. 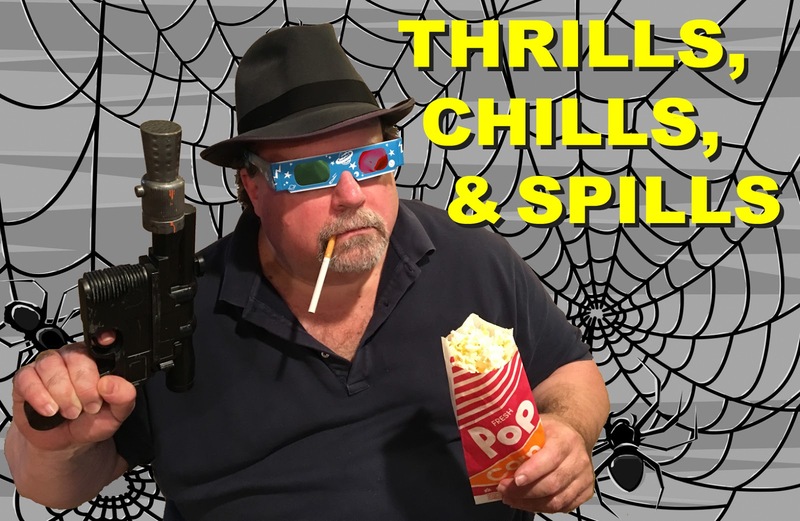 I will admit to being a sucker for superior heist films [The Killing; The Taking of Pelham One Two Three; The Getaway (1972); David Mamet’s Heist; Hell or High Water; Rififi; Ocean’s Eleven (both versions); A Fish Called Wanda; and Quick Change—notice how many of these films are also comedies?] I would place The Hot Rock into this larcenous Ten Best list. It’s that great. The Plot In Brief: John Dortmunder (Robert Redford) is released from prison and immediately starts his next big crime. 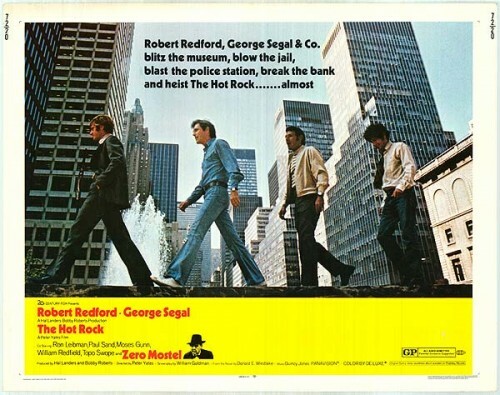 Together with his brother-in-law Kelp (George Segal), getaway driver Murch (Ron Leibman), and explosives expert Greenberg (Paul Sand), Dortmunder plans to steal the priceless Sahara Stone from the Brooklyn Museum at the behest of the African ambassador to the United Nations, Dr. Amusa (Moses Gunn). The robbery does not go as planned. Most heist films are either comedies or dramas but The Hot Rock resists easy categorization. Donald Westlake, who wrote the novel on which the film is based, said that the book started out serious and dark and would simply not stay that way; it kept veering off into comedy. Peter Yates seems to have recognized this, and he and his cast here perform a pretty nimble dance between genres. While much of the film is humorous and there are many laugh-out-loud moments, the audience never takes any of the heists less than seriously. 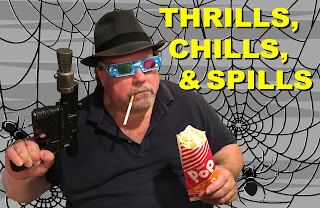 Stakes are high and the film never suggests that the crimes themselves are the stuff of comedy. Mixing genres is always a difficult feat to pull off and The Hot Rock does it well. POIGNANT TANGENT: We here at F This Movie! have sometimes described what we term “Shock and Awwwwww” moments in older films set in New York: a scene or skyline establishing shot that contains a glimpse of the World Trade Center. It’s a sight with the power to pull you out of any film. During a crazy helicopter flight through downtown Manhattan, The Hot Rock contains a particularly affecting “Shock and Awwwwww” moment, as the helicopter flies past the towers still under construction, and we see an only half-finished second tower. WEIRD CROSS BETWEEN SPOILER AND FORESHADOWING: If you ever get a chance to screen this film, by all means do. The phrase “Afghanistan Banana Stand” will take on a whole different meaning to you. Honest. Why my mother waltzed us out of that screening decades ago remains a mystery. Did she have to get home and start boiling dinner? Did my mother think this film would give her impressionable ten-year old “ideas”? I still remember the exact moment we left; it was when Paul Sand’s cellmate will not stop picking his feet, and it drives Sand crazy. Did it also drive my mother crazy? Was she afraid that I would start picking my feet? The world may never know…but now it doesn’t matter. I finally have this beautiful restoration and I can watch it all the way through whenever I want. I WIN, MOM.